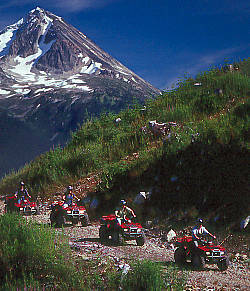 See the backcountry of British Columbia from the seat of an All Terrain Vehicle, commonly known as an ATV. 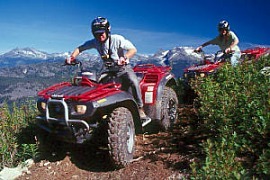 ATV's allow access to places where few people go. Infact, these sure-footed machines can take you places that even horses fear to tread! 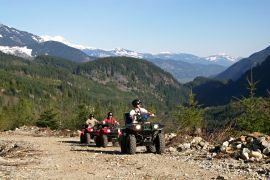 Through BC there are ATV tour operators with experienced and local guides ready to take you into their wilderness region. 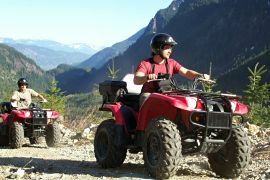 ATV tours take you over trails and backroads into BC's pristine backcountry to enjoy breathtaking vistas of majestic green forests, crystal clear streams and lakes; open meadows and snow capped mountains. This is your opportunity to see BC's wildlife and waterfowl in their natural habitat. Be sure to take your camera, as there are photo ops around every bend. Before any tour gets underway, your top-notch guide will make sure you are familiar with your machine, as safety is of utmost importance. These measures help assure you of a ride that is safe, comfortable and fun. Experienced guides lead the way making frequent stop and setting a pace conducive to all riders.